April can be an awkward travel month between winter and summer, when you’re restless and still shaking off cabin fever. You know you want to take a trip but don’t necessarily know what kind. It’s a bit too warm to go careening down the side of a mountain, but the full-blown summer lake parties won’t be going down for another two months. The weather is gorgeous one minute, but it is also probably going to rain in 15 minutes. 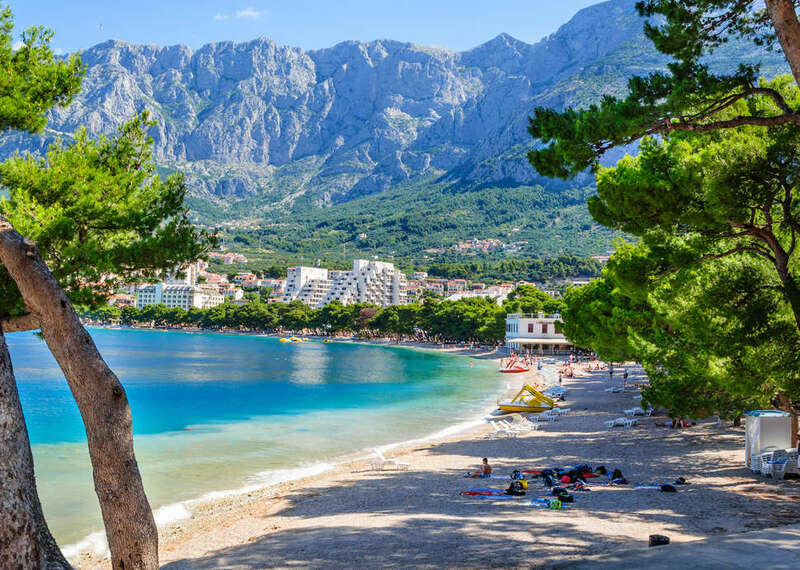 There are, fortunately, a number of destinations both at home and abroad that are at their prettiest, cheapest, and/or least-crowded during April. And there are those locales with recently opened attractions just waiting for you. Here are this year’s top 10 choices for kicking off spring with a bang. This city-state in Southeast Asia is one of the greatest food destinations in the world, and the best way to experience it will be here at the World Gourmet Summit, which kicks off April 1 and runs all the way through May 12. Dozens of partner restaurants and master chefs from all over the world will showcase special menus including their top dishes -- and while a lot of this is the invite-only level of fancy, there are also a ton of events with available reservations. The festival also includes dinners hosted by all manner of international vintners, plus a smattering of celebrities and after-parties. 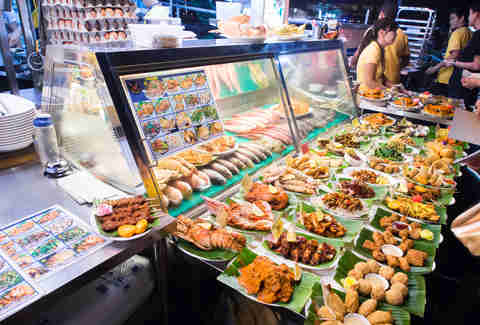 And if that’s simply not your scene, Singapore still boasts some of the world’s best street food; you’d actively have to seek out a bad meal. As a bonus, if you’re there April 13-14 you can also catch the World Rugby Sevens tournament. April is officially Virginia Vineyard Month (if you celebrate that sort of thing), and the state’s nearly 300 wineries pull out all the stops. With nearly a dozen big wine festivals, you’ll find individual twists at each, like a focus on oysters or carnival rides or, well, beer. 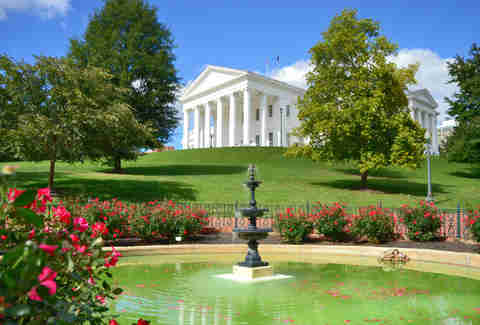 Richmond already rocks a renowned ballet and repertory theater; it’s time you came down to see what the fuss is about. The once-boarded downtown is alive again, with record stores and thrift shops lining the streets and a converted dry goods store now serving as the Quirk Hotel. It’s also become one of the best beer towns in the South, with Veil Brewing, Hardywood Park, and downtown’s Answer Brewpub all must-hits. Warm April days are also the perfect time to come and experience the James River and to horse around in the Pony Pastures Rapid Park. Picking the best time of year to go to Hawaii is kind of like picking your favorite ice cream flavor; it’s all good. That said, April might have Oahu’s best lineup of things to do, beyond napping on the beach and hiking Diamond Head. 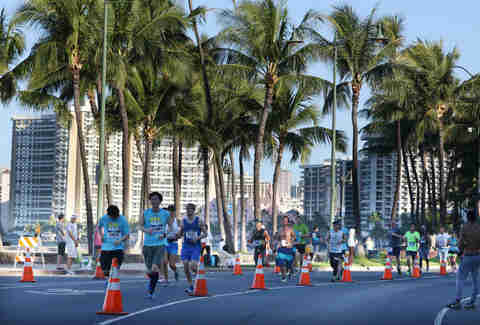 If your new year’s goal was to run more, there’s really no better place to do that than the Hapalua, Hawaii’s half-marathon on April 14. If your goal was to consume more Spam, you are in the right place. On April 27, the annual Waikiki Spam Jam attracts tens of thousands of people to Kalakaua Avenue, all sampling Spam made in every way you could possibly imagine. Spam sushi. Spam pizza. Spam pho. Chocolate-covered Spam. It’s an education in both Hawaiian and Spam culture, all at the venerable Outrigger Waikiki Beach. And it’s free to attend! Just bring some cans of Spam to donate. April is also Idaho Craft Beer Month! Breweries statewide will be holding special events and pub crawls throughout the month to showcase what Gem State beer is all about. 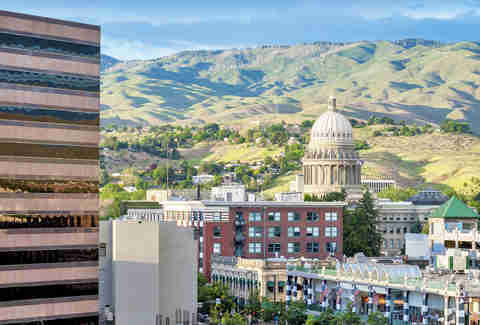 It all wraps up at the end of the month in Boise, when a massive beer festival takes over downtown with brewers from all over Idaho and the rest of the beer-crazy West pouring samples in the warm mountain sunshine. Whenever people learn that I backpacked for a long time, they invariably ask which place in the world was my favorite; I have increasingly defaulted to saying Croatia. The coast is breathtaking. The food and wine and natural wonders are all 10/10, and it’s a cheaper European destination than anything you’ll find farther north. From April 22-28, Dubrovnik hosts Festiwine, which brings more than 100 regional winemakers into the city so that you might sample their goods. 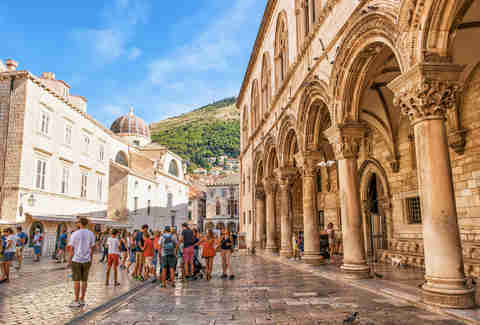 If you’re the sort of person who is still upright and chipper after that sort of week, you can sweat your way through the city’s famous walled streets in the Dubrovnik half-marathon on the 28th and 29th. Not enough of a challenge? Kick off your month with a different run, the 100 Miles of Istria on April 6 -- more than a thousand people will race through Medieval stone towns along the Adriatic. Cool off by heading into Krka National Park, just a short hop from the town of Sibenik -- you can jump off the iconic waterfalls by sneaking around the lifeguards, who don’t especially care too much by the end of the day anyway. 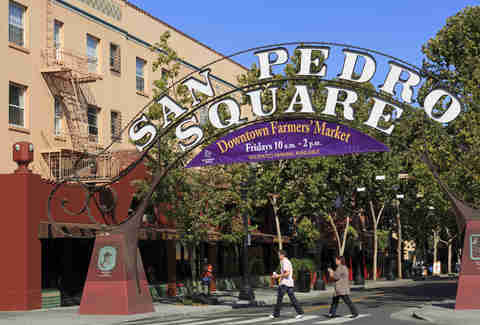 April is the tail end of the dry season in San Jose, meaning it’s the perfect time to amble down Santana Row or enjoy some live music at San Pedro Square Market. If you arrive on the early side of the month, you can catch San Jose’s free monthly craft fair on April 6. And on April 13, the Bacon and Beer Classic comes to town. The San Jose leg of the Bacon Beer and Cheese Classic involves more than 100 kinds of beers and more than 30 kinds of bacon snacks. There will be, yes, a bacon-eating contest. Tickets for the event start at $59, and they ensure you unlimited bacon. A couple of minutes’ drive west, you’ll find the splendor of the Cupertino Cherry Blossom Festival on April 27-28, featuring food, drink, and dancing to honor Cupertino’s sister city, Toyokawa, Japan. Food festivals with Michelin-starred chefs and culinary masters from the world’s best restaurants are already fun even without the addition of kangaroos. South Australia capitol Adelaide hosts the annual Tasting Australia food festival April 5-14, where a seemingly endless parade of wine tastings is mixed with events focusing on things like craft beer,dumplings, escargot, and even dinners eaten entirely in the dark. Autumn here is a beautiful time, when some of the country’s top wine regions are still mid-harvest and the sunsets over the vineyards are pure magic. 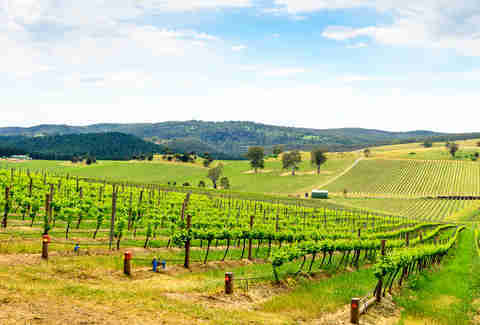 When the first cold snap hits, the colors along the Barossa ranges are a magnificent green and gold. 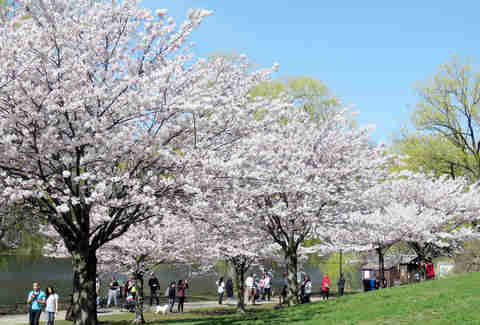 The cherry blossoms in D.C. are among the most iconic outside of Japan, but Toronto’s High Park offerings are every bit as impressive. Come late April, which is also a great chance to check out the city’s new Museum of Contemporary Art, a 55,000-square-foot space that opened late last year in an old industrial building within the Junction Triangle neighborhood. The spring thaw kickstarts a whole festival season in Canada. It begins in Toronto with the Creativ Festival April 12-13, in which craft makers and scrapbookers from all over the country converge. From April 25 through May 5 the Hot Docs fest -- the largest documentary film festival in North America -- draws more than 20,000 attendees and screens more than 200 films. Add that to four professional sports when the Blue Jays and Toronto FC begin their seasons as the Raptors and Leafs wind theirs down, and this is definitely the month to check out one of the world’s most diverse cities. 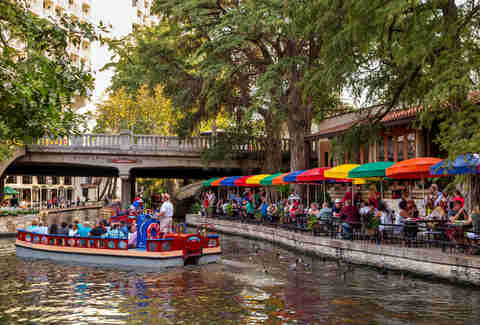 From April 18-28, the city hosts the annual Fiesta San Antonio, which honors the heroes of the Alamo but has morphed into a citywide event with a Fiesta King and Queen, chicken on a stick, and colorful costumes. Don’t miss A Night In Old San Antonio, where dancers and hundreds of food and drink vendors show out to celebrate the city’s heritage. The first week of April brings Philly Wine Week, with wine tastings and events sprinkled all around the city. Moving right along to April 14, we’ve got the Manayunk StrEAT Food Festival, when 50 of the state’s top food trucks and vendors come together along historic Main Street. On April 28, don’t miss Flavors of the Avenue, a food festival spread across five city blocks, including craft beer and live music. Or, if you happen to wander farther west across the state, on April 3-7 the borough of Meyersdale hosts the bulk of the Pennsylvania Maple Festival, as it has for more than 70 years. There’s a Grand Parade on April 6, plus a Maple Run 5k, a Maple Queen Pageant, plus an ongoing Annual Quilt Show (tickets start at $2). And, of course, there is an iconic pancake shack. 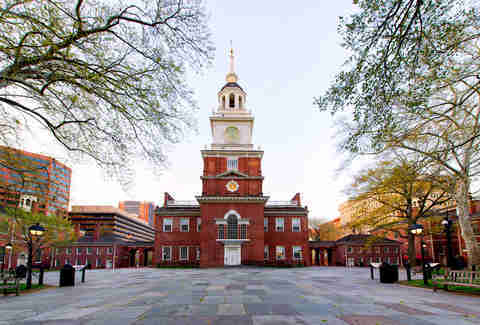 Come to Pennsylvania hungry, basically. Planning a trip for a different time of year? Check out our monthly travel recommendations for the best places to travel in January, February, March, May, June, July, August, September, October, November, and December.